Home » Breakfast » Cinnamon Sugar Egg Free Waffles. Cinnamon Sugar Egg Free Waffles. 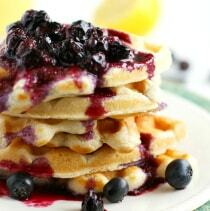 There’s nothing like a stack of delicious egg free waffles to start your day! 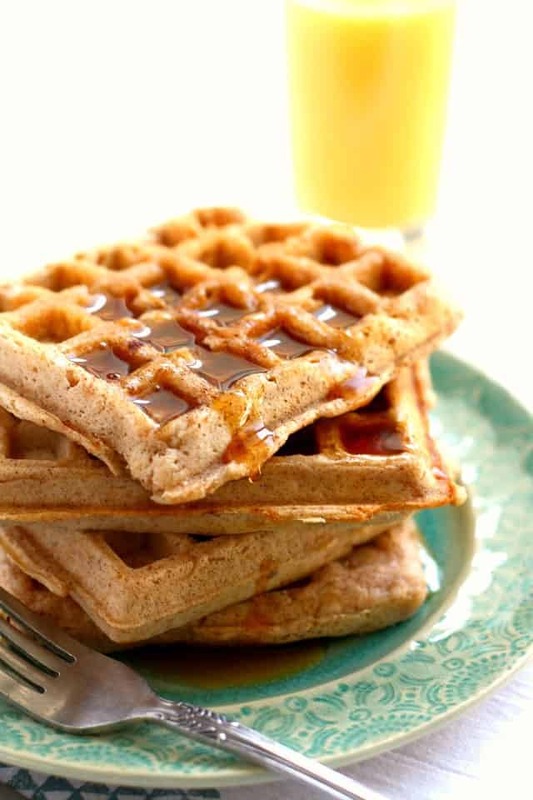 These cinnamon sugar waffles are light and fluffy, and perfect when topped with maple syrup! It didn’t completely break, but the last few times I used it, it was getting so hot even on the outside that I was afraid something was seriously wrong with it. The last thing I need is to start an electrical fire with a small appliance. Once I knew it had to be replaced, then I was faced with a decision…did I want to make round waffles or rectangular waffles? This was a tough choice! ;) I eventually decided on rectangles, and I’m so happy with my new waffle iron. We usually make either waffles or pancakes on the weekend, and this past weekend I decided I wanted to try a variation on my usual waffle recipe. I used a blend of whole spelt and white spelt flour, and I added more cinnamon and sugar to the batter. 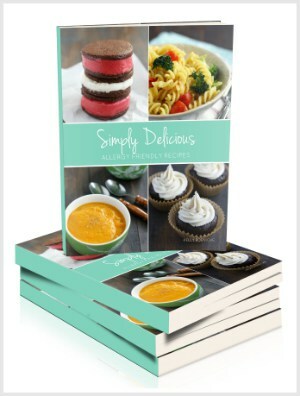 This recipe was a big hit with my family! These were gobbled up in no time. Can you really make light and fluffy egg free waffles? Yes, you can! If you’ve been avoiding waffles because you have an egg allergy or follow a vegan diet, I think you’ll be surprised at how delicious these egg free waffles are. The secret is a higher amount of baking powder, and a little bit of vinegar to replace the eggs. 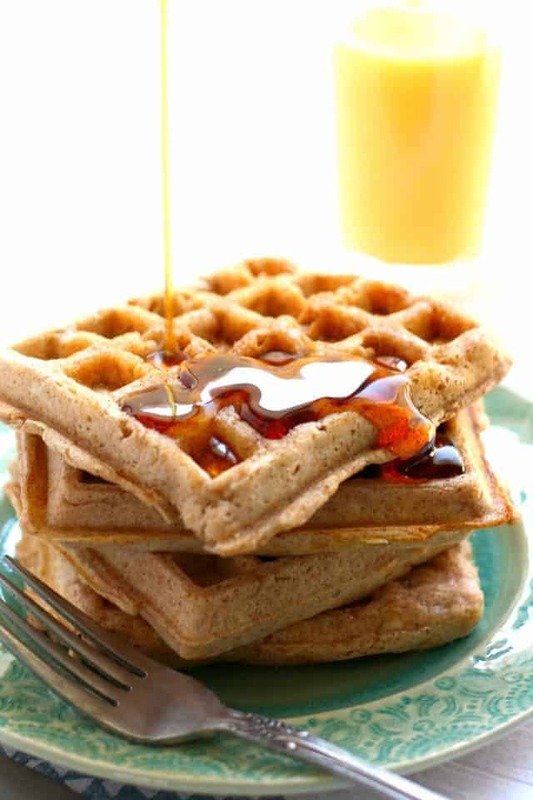 These two ingredients allow the batter to puff up nicely and makes a very tender waffle. 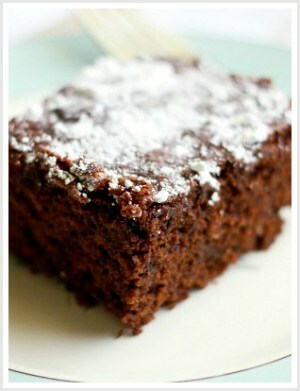 I used spelt flour, but you can use all-purpose flour if you prefer. 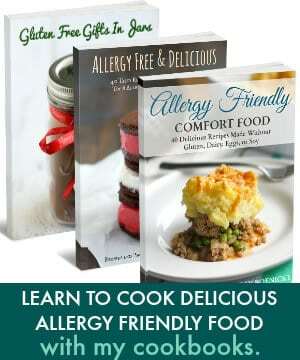 I haven’t tried these with gluten free flour yet – let me know if you do! 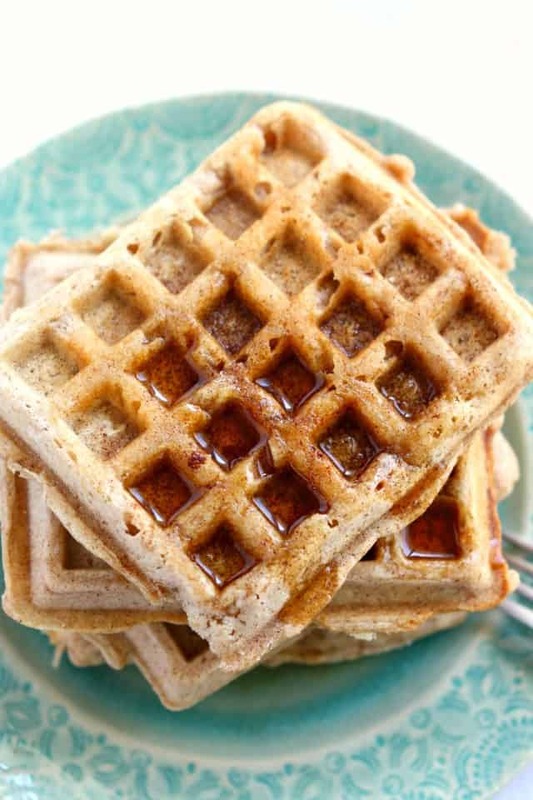 These cinnamon sugar egg free waffles are light, fluffy, and delicious! In a large bowl, whisk together the spelt flour, baking powder, salt, cinnamon, and sugar. Add the melted vegan buttery spread, water, vinegar, and oil. Let the batter rise for about five minutes. Spoon the batter into the preheated waffle iron. Cook according to your waffle iron's instructions. It takes about five minutes for my waffle iron, yours may be different. Serve with more vegan buttery spread, cinnamon sugar, and maple syrup. ice cream and hot fudge for a dessert idea! « Vegan Chocolate Chia Seed Pudding with Sunbutter and Berries. 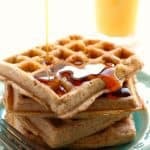 Just a heads up for others who would be thinking to try these waffles in the same way I did, save yourself the hassle and pass this one over if you are using gluten-free flour. I’m not certain what it was, (since the package on the no-wheat flour I used said substituting one cup GF for one cup normal flour should be fine for most things,) but I think it was the combination of the lack of egg and the particular GF flour I used. They simply wouldn’t cook through! I got a thin crusty shell on the outsides, but the insides were raw no matter what I did–waffle iron, stovetop pancake-style frying, even finishing them in the oven, nothing made them bake through. The top parts that did cook tasted lovely, so I’m sure it’s not an issue with the base recipe, just be aware that GF brown rice flour/gum didn’t work out. I made these tonight and they were amazing! I used whole wheat pastry flour, earth balance and apple cider vinegar. I love how quick and easy they are and that the recipe uses water instead of plant/nut milk which I don’t always have on hand. My new go-to waffle recipe for sure! So glad to hear you loved them! Thank you for letting me know! My husband ans I have recently adopted a plant based (vegan) diet, and noticed today that I had to toss my waffle mix because of the milk! So I came upon your recipe this morning, made it for breakfast and WOW ??? Some day I hope to start a vegan food review blog, but for now I’ll give you a ⭐️ ⭐️ ⭐️ ⭐️ ⭐️ and thanks for sharing! Yay! I am so glad to hear that! Thank you so much for letting me know and for the 5 stars!! Looks great! When do you add the vinegar? When you add the other wet ingredients! THanks for spotting that, I will fix it. I don’t have a waffle iron but I’d love to make these they sound delicious and perfect for my allergies to soya dairy and eggs! :) could I use a pan to make them? Thanks. Sure, I would just make them into pancakes! Thanks for the reply :) Excited to give these a try now! LOL, it amazes me how long waffle irons do last – sounds like you got a good run out of this last one! The round-versus-square conundrum is real when it comes to waffle decisions…I’m a fan of the square, myself! I had no clue the secret to vegan waffles was baking powder and vinegar! So brilliant! I’ll be sure to try this on my next round! 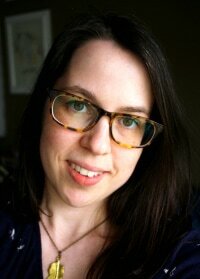 Thanks, Julia! Even if you eat eggs, it’s a good recipe to have on hand for when you are out of them! Could you be my egg free goddess? We both posted new waffle recipes this week!! Totally food twinning it. ;) Love it! I’m also absolutely loving that these waffles are egg-free—you’d never be able to tell because they look so crisp and airy! fluffy waffles without eggs? Im beyond impressed! I could devour a whole plate of these waffles!